Here are some of the stimulating events we have found so far. Please let us know of others. 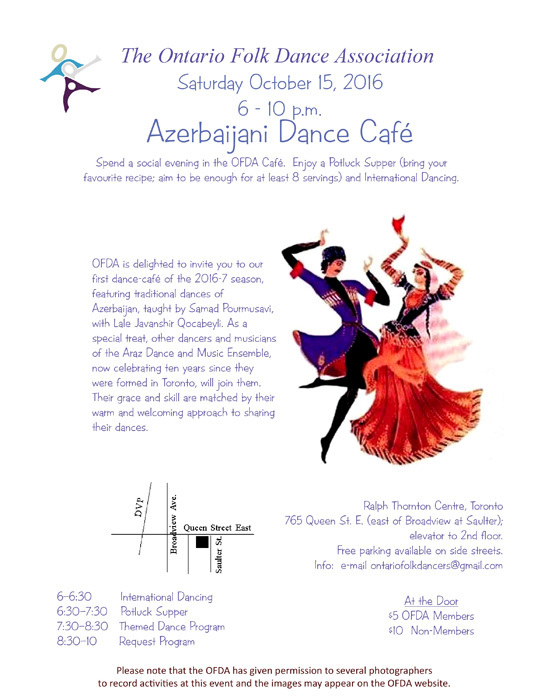 Azerbaijani Dance Café. Saturday October 15. $5-$10. Spend a social evening at the OFDA Café. Enjoy International Dancing and a Potluck Supper. Bring your favourite recipe (with enough for at least 8 servings). Find out where Azerbaijan is located. Dancing will start at 6 pm. Potluck supper at 6:30 pm. Ralph Thornton Centre, 765 Queen Street East, east of Broadview at Saulter; elevator to 2nd floor, free parking available on side streets. Info: e-mail ontariofolkdancers@gmail.com; http://ofda.ca/wp/ofda-cafes/. Black Culture. 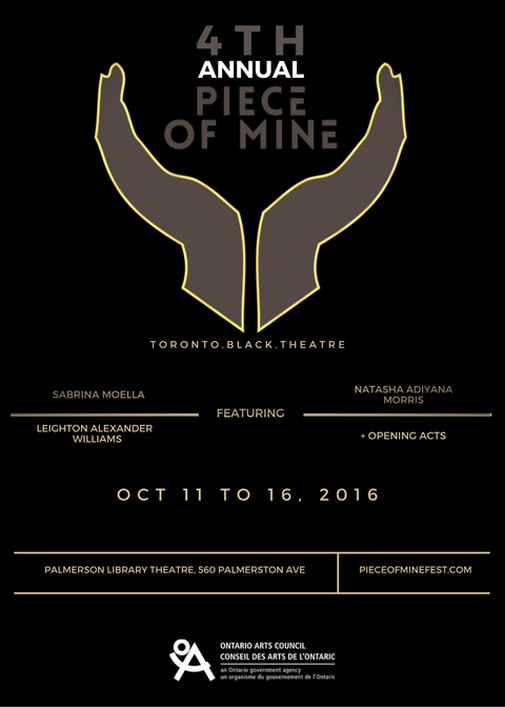 Piece of Mine Festival. October 11-16. $15-$25. Palmerston Library Theatre, 560 Palmerston Avenue. It’s fun to discover the world through other cultures via theatre. http://pieceofminefest.com/index.html Buddhist, Interfaith and Japanese. Nembutsu Chanting. Sunday October 16th, 9:30-10:30am. Free. 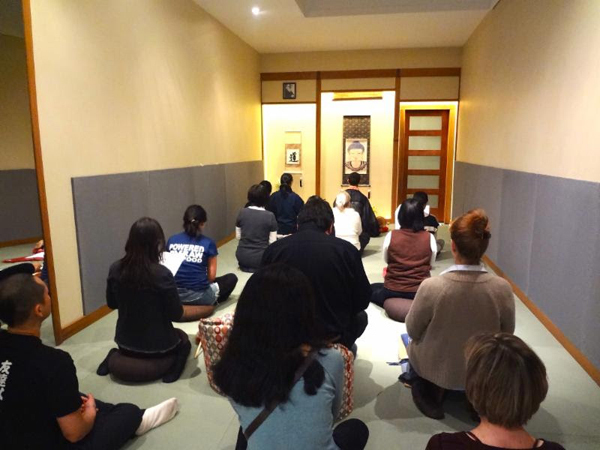 Recitation of “Namu Amida”, “Namu Jesus,” Namu Allah” and “Namu Adonai.” “ Through this practice we heighten our spiritual awareness and help ourselves and others to heal.” Tao Sangha Toronto Healing Centre, 375 Jane Street. 416-925-7575, http://taosangha-na.com/toronto. We had complaints that this group didn’t have enough room at its festival last year for all the people wanting to join it. We understand that the room is bigger this year. Let us know. For information about the Vesuvius Ensemble – http://vesuviusensemble.com/en/musicians. 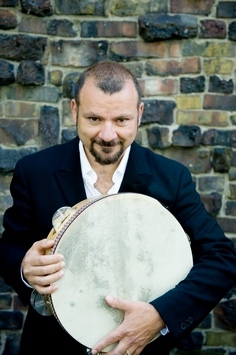 Image of Tenor Francesco Pellegrino from: http://vesuviusensemble.com/en/musicians. Jewish. Sukkot/Sukkah. Sundown on Sunday, October 16 to October 23 at sundown. This annual harvest festival is celebrated by building a sukkot or temporary shelter in synagogues and homes. Many followers eat all meals during this time in a sukkot and might even sleep in one. It commemorates the shelters built during the 40 years of wandering in the Sinai desert, the Exodus of the Jews led by Moses from Egypt about 3500 years ago. http://toriavey.com/what-is-sukkot/. 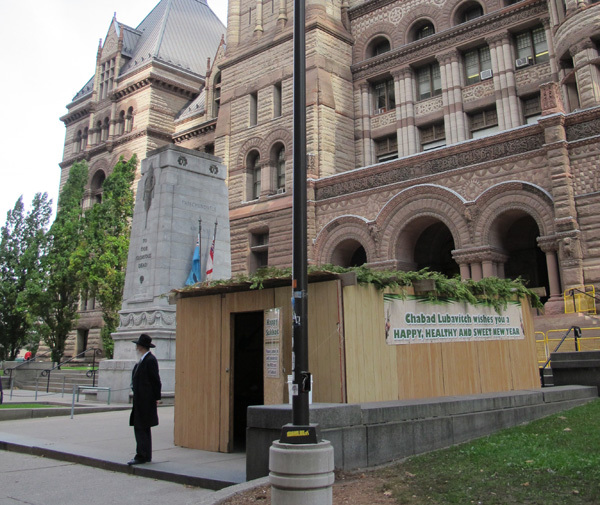 Usually a Sukkot structure is in front of Old City Hall during this period with a rabbi available to answer questions. It provides a place where workers downtown can lunch together. A sukkot has been at this site for several decades annually during the Sukkot festival. www.winchevskycentre.org . info@winchevskycentre.org . Latin. Wheel Dance. Fall Session: Sundays, October 16 – November 20. 12-1pm. $70 or $10 per class. Financial assistance available. Miles Nadal Jewish Community Centre, 750 Spadina Avenue.“Learn Latin Dance in a comfortable and accessible environment. Classes will cover the basic elements of partner dancing, with an emphasis on basic patterns, turns and timing, moving across the dance floor, and having fun. A mixed abilities class – everyone welcome. Bring a partner or come on your own.“Winter session January 8-February 12 also available. Contact liviyam@mnjcc. Image from M.N. Jewish Community Centre website. Multicultural. Rutas. October 5-16. It’s not too late to see innovative performances like Hamlet de los Andes and SolOthello. “There are still deals available on tickets. (Some tickets $15-$25, or 4 for $70 – call 416-531-1402). For Artist Bursaries for our Master Classes (email sue@alunatheatre.ca).” Daniels Spectrum, 585 Dundas Street East. Artists from Colombia, Bolivia, New York, New Zealand, Haiti, Venezuela, Argentina, and Switzerland. Download schedule here: rutas.ca Multi-faith Action Against Poverty marks the United Nations declaration of International Day for the Eradication of Poverty. Monday, October 17, 7pm. $15 (to cover cost of your food). Auditorium, Noor Cultural Centre, 123 Wynford Drive. “Faith-based groups will come together for a multi-faith action against poverty… The program will include a vegetarian dinner, expert presentations on the problem of poverty in Toronto from economic, policy, legal, and service perspectives, and action items. Panel presenters TBA. Muslim. Ashura (10 Muharram). October 11-12. Ashura has been a day of fasting for Sunni Muslims. It commemorates two historical events: the day Nuh (Noah) left the Ark, and the day that Musa (Moses) was saved from the Egyptians by Allah. Shi’a Muslims use the day to commemorate the martyrdom of Hussein, a grandson of the Prophet, in 680 CE. It is a day of mourning. The only Ashura procession we have heard about so far in Toronto is Wednesday, October 12. Toronto Ashora Possession(دسته سینه زنی عاشورا تورنتو) 2016. “This is a religious procession on the day of Ashura and is open to all Muslims and non Muslims. Start: Mel Lastman Square, 5100 Yonge Street. North on Yonge St. Unit Center St. Behind Iranian plaza. Arrival 9:30am. Start of procession 10:00am. The ending will give everyone enough time to reach their Centres for Ashura program InshaAllah.” https://en-ca.pricett.com/a/toronto-ashora-possession-2016/865199. In 2015, Ashura processions were on University Avenue as well. If we get information about this one after press time, we will give details at the bottom of this blog. A video of one of these processions is on: https://www.youtube.com/watch?v=QdxzfzNNSiM. Another commemoration is at http://jaffari.org/jcc/ shia – Jaffari community centre: http://jaffari.org/occasion-27/. Syria. A Living History. Opening October 15 and continuing to February 26, 2017. Exhibition, symposium, lectures, performances. General admission to museum $8-$20. More for separate programs. Aga Khan Museum, 77 Wynford Drive. 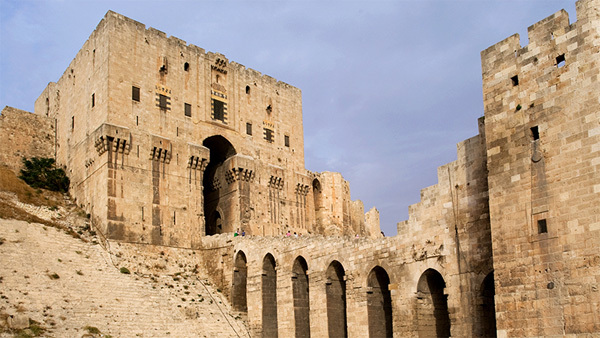 https://www.agakhanmuseum.org/exhibitions/syria-living-history. Make a note also of the Syrian Film Festival, Nov. 4 at Isabel Bader Theatre, and November 5-6 at Jackman Hall Theatre, Art Gallery of Ontario. Syff.ca. Tell us about your adventures in Multicultural Toronto. Write to Ruth at: ruthlormalloy@gmail.com. Featured image from Tao Sangha North America website. India. I just learned about the Indian Diwali RAZZMATAZZ 2016. 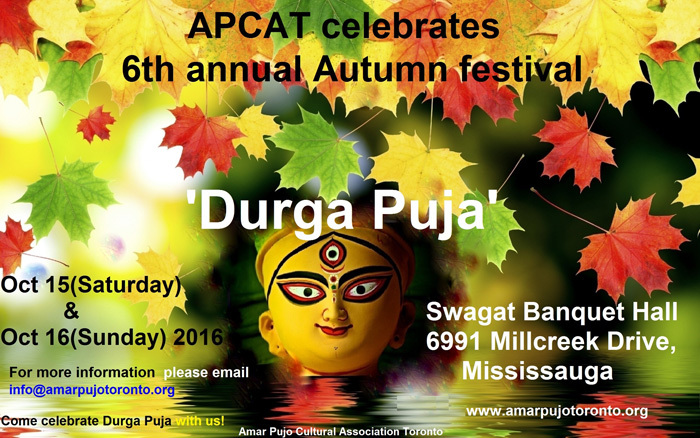 Mississauga Celebration Square: Oct 14, 15 & 16. http://www.diwalirazzmatazz.com/. Ruth. Thanks to friend Mahmoud, information about the Ashura event is on: http://en.cijnews.com/?p=49535 at Mel Lastman Square on October 12 at 9am.. Another procession is Sunday, October 9 at Queen’s Park at 11am.. Pictured in the news article is a bloody procession from Iraq, not Toronto. This is a very serious religious event, one I saw myself years ago in India.